ABSOLUTELY CLEAN NEEDS YOUR VOTES!! Absolutely Clean has hijacked the KCRG A List competition! Every Year KCRG holds a "Best of" Cedar Rapids competition, where fans vote for their favorite business. Each year, our industry gets over looked, but this year that changes! We are taking over the competition and need your help! Follow the link below to show your support and Vote Absolute Clean the "A List" Cleaners of the Cedar Rapids Area! 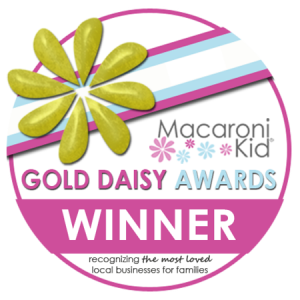 Voting Closes March 13th! Vote Today! Do you like Absolutely Clean? Show us your love! Follow the link below and vote today! Why Vote for Absolutely Clean? Every employee at Absolutely Clean is a highly trained professional with a keen eye for detail. We understand the home is a precious place and that a clean home can mean a clear mind. We only use all organic cleaning products as we believe that the products used in your home should be safe for your loved ones and your pets. We want to share the gift of time with you and your family! Don’t Miss Our Annual Valentine’s Gift Package Special! Treat your special someone to the gift of time! Delivery available! See how Absolutely Clean can help make your holiday so sweet! ONLY $147 for all three! We will deliver to your sweetie on Valentine’s day for $5 or you can pick up a gift package! Click Here to Purchase this Special Now! Absolutely Clean also has other Gift Card Specials available! Be sure to check out all of our deals! It’s been a busy couple of weeks so my apologies that this is late as we wrap up 2014. It was a good year. The number I am most proud of is our staff retention. I would venture to guess that we have the lowest turnover rate in our area in OUR industry. 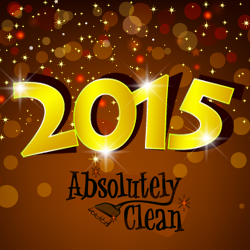 Our turnover for 2014 was only 14%, we love that we can give you consistent cleaners. That number is even lower if we take out the people that didn’t make it past orientation. 2015 will see an even lower number! Our staff are appreciated and they FEEL it. That’s something that happens on both sides of their day — with me and with YOU. Thank you for always treating our staff like they are truly #morethanmaids. View Our New Web Offers! $147 for 2 Hour Cleaning, a Massag & Merlot!! AVAILABLE FOR PURCHASE NOW! The holiday is fast approaching so don’t miss your chance for this amazing deal! For only $147 get a 2 Hour Priority Clean, a Massage and a Bottle of Wine (Red & White Choices Available)! You make the cleaning list, we’ll tackle it in 2 hours! 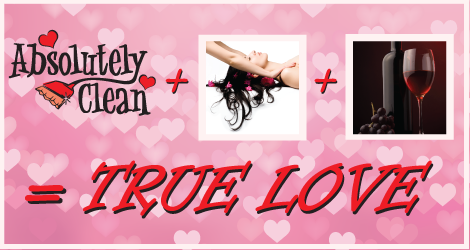 While we clean, pamper your Valentine! We will deliver to your sweetie on Valentine’s day for $5 or you can pick up a gift package! Call us at 319-377-4404 with questions. Don’t miss this deal, BUY NOW! No Windows or Fridge Cleans – These Can be added at the time of booking. Subject to Schedule and Availability. Limit of 4 per household and 4 gifts per household. 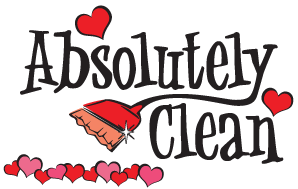 Local Food Banks – Absolutely Clean will be collecting donations this month for all of the local food banks. If you wish to donate any items you can leave the items with a note for your team on your counter so we know we are ok to remove them from your home. You can also drop them by our office Mon.-Fri. between 9 am- 4 pm. Congratulations to This Months Winners!! 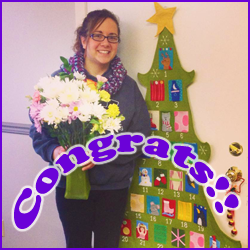 Emily is our Flower Power Winner this month! She’s only 19 but has quickly become one of our Absolutely Clean leaders. She’s a hard worker that handles not only our day shift but many shifts in our commercial division. Winning flower power within our company so soon? This speaks highly of the way she treats our staff. Keep it up Emily! ALSO, This Months Maintenance Clean winner is Kathy Briney! Thank you for returning your client surveys within 24 hours of your clean, enjoy some extra time on us! We’ve placed the cleaning credit on your account! Want to be entered to win a free clean?? 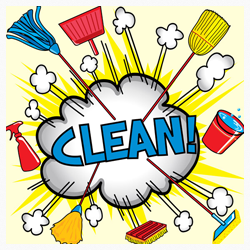 Click Here to Tell us all about your clean! Connect with us online for more deals! 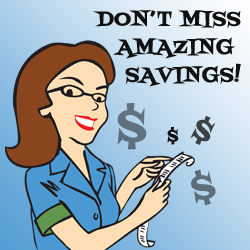 TODAY ONLY – $99 for a 2 Hour Priority Clean! You make the cleaning list, we’ll tackle it in 2 hours! Current Clients CAN purchase this deal for extra Holiday Cleans or as a Gift for Friends! Its the perfect gift for the Holidays! Call us at 319-377-4404 with questions. Don’t miss this deal, the sale ends at Midnight, BUY NOW! 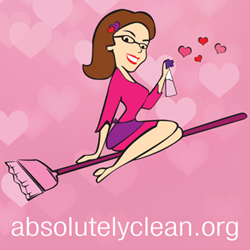 Absolutely Clean is a conglomeration of moms, teachers, coaches, and active members of the community. We are people, just like you, who want to have clean houses and more time! At Absolutely Clean, we provide you with both of these valuable scarcities, and with the most personal of touches! Now we want to share a special deal with you! 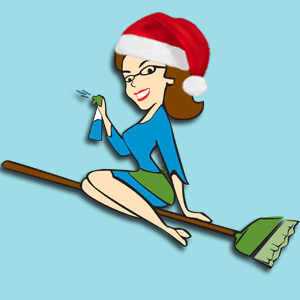 Clean up for the holidays! Don't miss this special offer, AVAILABLE TODAY ONLY, Saturday November 29th. For only $99 get a 2 Hour Priority Clean! You make the cleaning list, we’ll tackle it in 2 hours! Current Clients CAN purchase this deal for extra Holiday Cleans or as a Gift for Friends! Its the perfect gift for the Holidays! Give us a call at 319-377-4404 to discuss and Pay for your Cleaning in Advance! 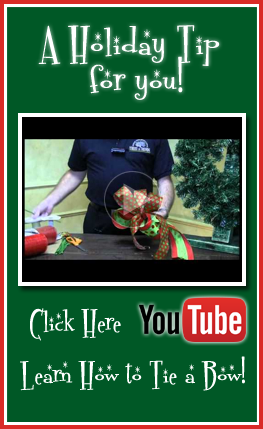 Let us take care of your holiday gift wrapping! 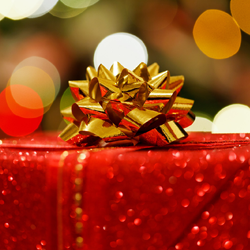 Your crew will wrap up to 2 gifts at no charge at each of your cleans in December. Just leave the gifts with your supplies out and we will take care of the rest! Want us to take more time off your hands? For just $3 per gift wrapped we will complete up to 5 extra gifts per clean. Call us at 319-377-4404 to set up if you wish to have more than 5 completed. Waypoint / Madge Phillips Center – On December 3rd our staff will be volunteering their time to clean the living areas of the Waypoint Madge Phillips Center to provide all the residents with a clean, healthy living space. We will also be collecting items in need for the shelter and holiday programs. 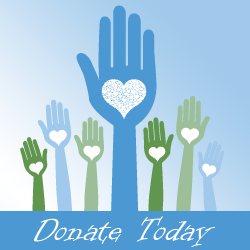 We welcome any and all contributions from our clients towards the items collected. This Months Maintenance Clean winner is Calleen Banes! Thank you for returning your client surveys within 24 hours of your clean, enjoy some extra time on us! Be sure to fill out your surveys to be entered to win! Want to leave a holiday tip for our team?? Holiday tips are distributed among your entire Absolutely Clean team. From our wonderful laundry girls to our cheerful office staff and hardworking field staff we all work together to complete the Absolutely Clean home cleaning experience. Baked goods, gifts and tips are all brought back to the office for all to enjoy. If you would like to leave a cash/check tip, goodies, or tangible goods please make them out to Absolutely Clean. We will never remove an item from your home unless permission is given, so please leave a note for your team. Thank You & Happy Holidays from our Team!